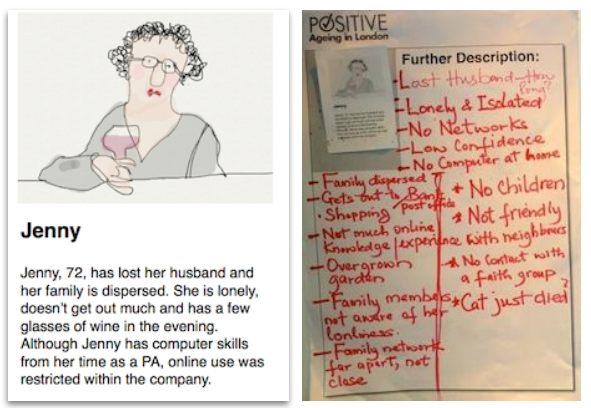 Summary: How we used a cast of fictitious characters and organisations to help a London borough plan its digital participation strategy in the face of austerity cuts. 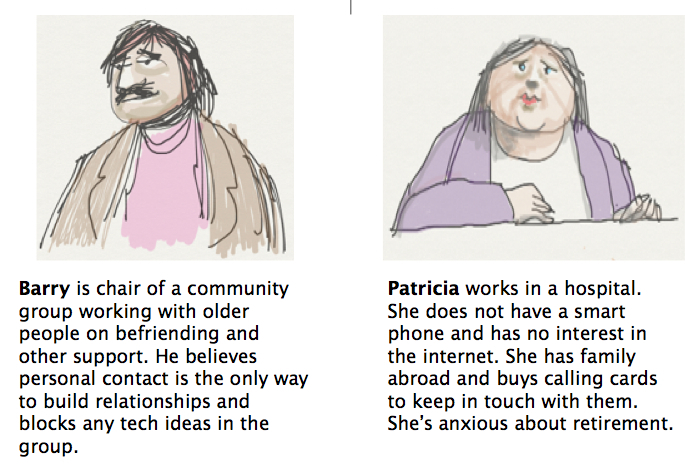 Over the past few years Drew Mackie and I have used fictitious characters and organisations as the basis for our workshop games, with successful explorations of how digital tech can be used by community enablers, nonprofit consultants, older people and other groups. Recently we’ve coalesced these into Slipham, a place with all the social and civic challenges that we hope digital tech might help address. To do this a core group of Slipham digital champions are staging a creative planning session that includes some external advisers. 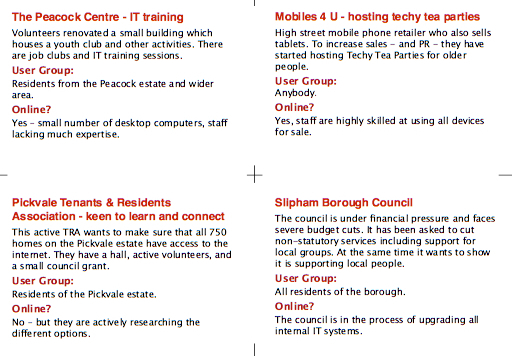 They are looking at the assets in Slipham that could be better used, and networks that could be further developed. They are also researching innovations elsewhere. Some 60 people spent two hours working on the challenge in groups. First they selected some characters from the persona cards we had created (enlivened by Drew’s cartoons), chose a theme to address and some organisations that might collaborate, and created a brief for a possible project. Then the groups exchanged briefs, and used cards with suggested activities and methods to create a project plan. That provided inspiration for possible projects that the people in the workshop could develop “for real”. You’ll find a full report of the workshop here. In planning the workshop we used the card-based organising system Trello, and afterwards I loaded up all the workshop materials. Trello is a terrific, free system for organising anything. 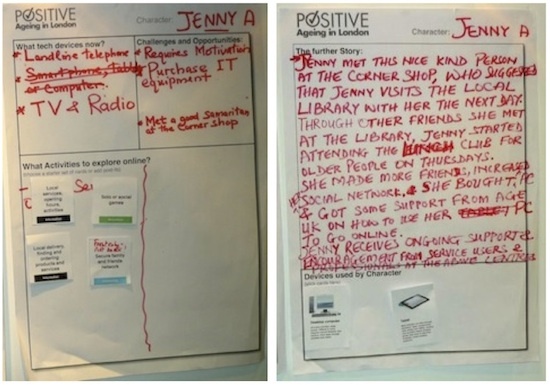 Imagine a virtual wall of Post-it notes – but with scope to add images, links, checklists, discussions on the back. You can keep boards personal and private, make them public, or use in a team. Here’s a few bookmarks about using Trello. 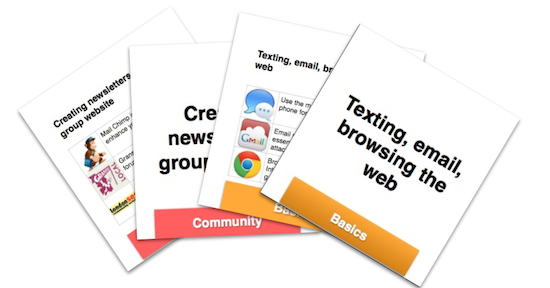 how we might create cards on Trello and print them off for use in workshops. Currently we do that in Pages. If you are interested in a game session, and/or further development, do get in touch. Huge thanks to Kevin Dykes, Cara Pottinger and Southwark colleagues for the opportunity to run the game, and joining so enthusiastically in designing and helping run the session. We’ll be staying in touch as workshop participants and others develop projects triggered by the session, and other work Southwark is doing. Recently Drew Mackie and I ran a training workshop about social reporting with community builders at Forever Manchester, as I trailed here. In practice it was more of an exchange of ideas, insights and triggers for further exploration … which is how we hoped it would turn out. We learned a lot. I won’t attempt a detailed description, but want to share some of the materials we used, partly because they relate to a further exploration I’ll write about in my next post. I also want to mention a couple of interesting developments we’ve seen since the workshop. Briefly, we gave a presentation about how we saw social reporting supporting community building, with a strong focus on mapping and building networks. Slides here. Then we played a new variation of the Social by Social game. 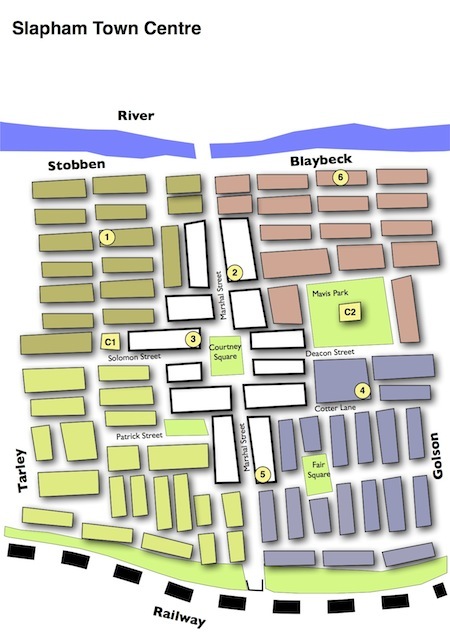 We invented a fictitious place to give us a context, based on Slapham, which we have used in another game. We developed some challenges, reflected on how community builders might address them, and then used a set of cards to consider what tools might be relevant. I need to have a proper catch-up with Gary Loftus and the rest of the team in Manchester. However, at least two of the tools are in use. 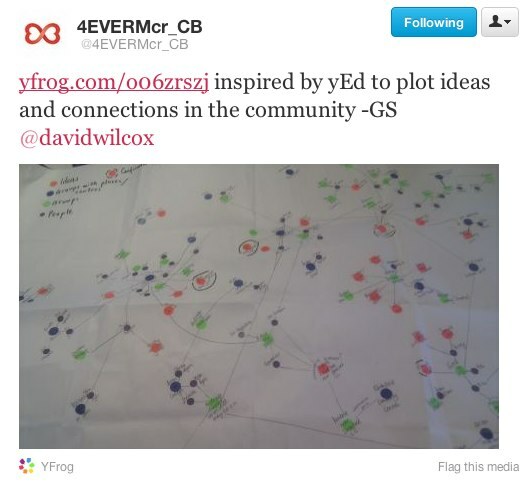 Gary Stanyard tweeted how he and the team are using the YeD network mapping software, also used by Drew, to draw both social and ideas connections. They are now avidly sharing ideas for development. The community noticeboard n0tice.com is now in use in Great Lever. We didn’t really know at the end of the workshop where our initial exploration would lead. Just what approaches and tools may be useful depend very much of local circumstances, and the particularly skills, equipment and disposition of the community builder. I’ve absolutely no doubt that the Manchester team will find lots of innovative applications – because of they bring such diverse experience, skills plus much enthusiasm to the work, and have great support from their organisation. They have started a blog here. 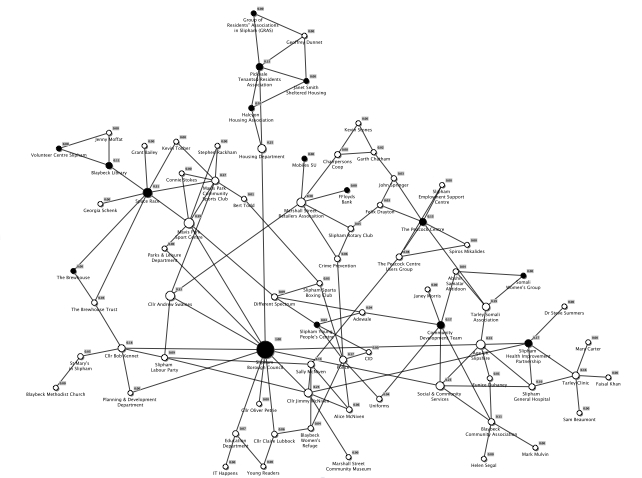 The day in Manchester was one the recent events that convinced me it is worth starting a more detailed exploration of community building, organising, enabling … networks … and how digital technology may help. That’s in the next post. Meanwhile, do drop a comment or get in touch if you are interested in a workshop. 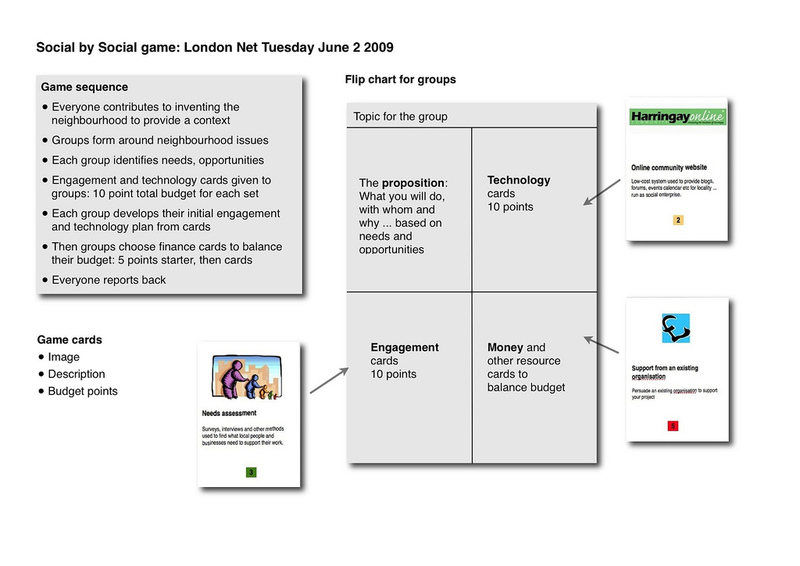 The game is designed so that it can be played “for real’ by substituting data from actual organisations, and there is scope for using a spreadsheet linked to more detailed business planning. The wider and in many ways more interesting scope lies in using the game – as we did at the conference – in prompting groups to think how they can work collaboratively with others in the town to share accommodation and other resources. This is highly relevant at a time when Big Lottery Fund and others are promoting asset based community development: here’s how it is working in Thornton Heath for example. We are still developing the game materials for a test run next week, and I’ll have more after that. 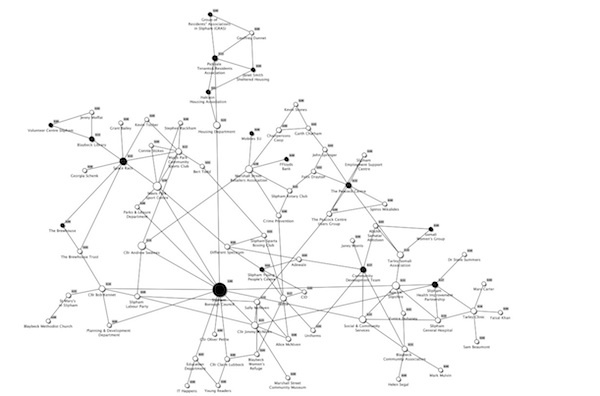 Meanwhile, I mentioned the game to Gavin Barker, who had blogged enthusiastically about the conference version, and who I knew does a lot on mapping community assets. Gavin has now added his own ideas in a blog post here on how geographical mapping could be added to the game … or rather to a further development of the game, since the Community Matters version has a tight brief. As we were sharing blog drafts and emails around this, I spotted the first newsletter from Spacehive, which is an online platform that enables local groups to pitch their projects for funding. This can certainly be one of the business development ideas to include as options for organisations in the game … but could perhaps play a bigger part in promoting collaborations. Drew reckons that we need some social network mapping in there too, since collaboration depends very much on the building of trust and relationships. Seeing who know who, and who holds what resources, is an important starting point. Overall we are getting to the point where we can see the Slapham scenario and props as the basis for a virtual lab to test out different sorts of games. We are also working on an upgrade of the social media game. The orginal conference session developed because Community Matters kindly asked if I would keynote at the conference … to which I said I would much rather run a workshop. In the event Drew did most of the work, and while some of the props were a big rough, the session was a big success because the pieces of card and maps were good enough to spark some conversations … and release the knowledge assets held by those participating. Much more useful than any presentation that I might offer. If you are interested in the gsame, do drop a comment or get in touch here. Here are some slides I developed over the Christmas holiday, not for any specific event, but just to clear my mind and provide a framework for thinking about social innovation and collaboration. I often don’t really know what I think until I write it down, and after making notes, drawing mindmaps, downloading a few iPad doodling apps, I hit on the idea of producing a presentation to myself. (I suggest clicking view on Slideshare and then full screen because the notes are a bit small). Towards the end of last year I was getting a bit sluggish on two fronts … what I wanted to blog about, and what sort of projects I wanted to do. And how to link the writing and doing. I’m at the EuroMeduc conference in Bellaria, Italy, which is proving a great opportunity to meet a range of teachers, researchers, librarians and policy people interested in media literacy … which is helping people gain access, understand and use different media. 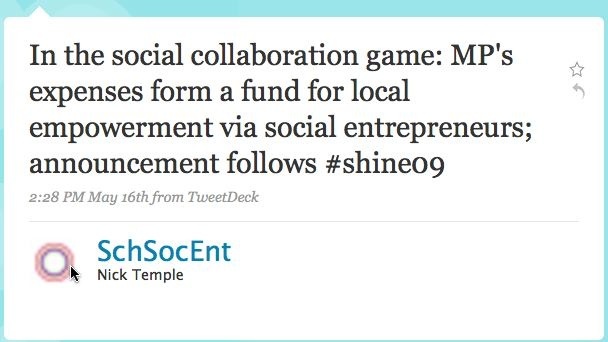 I had great fun at the SHINE09 unconference for social entrepreneurs last Friday and Saturday, first with a little light social reporting and then helping run the Social Collaboration Game, which I wrote about earlier. The social reporting was light for me because there were far more video cameras around than last year, and much more Twittering… but I did do a few interviews including a particularly interesting one with Ben Metz, leaving Ashoka after three years as UK director. We talked about some of the issues raised at the UK Carnegie Trust seminar on civil society associations. He hopes to see the rise of mutualism. I’ve blogged a full report of the game here, including downloads of the cards we used. Briefly, about 40 people for two hours inhabited a fictitious borough rather like East London in 2010, developing project ideas for neighbourhood renewal, mixing in some social tech from the cards ideas, and pitching to the the new Tory Minister for Civil Society (otherwise Cliff Prior CEO of Unltd) and council leader Jess Tyrrell (of conference organisers Germination).